Among the reasons supporters of environmentalist Annette Smith sought to write her in as the Progressive Party's gubernatorial candidate was to secure her inclusion in this fall's debates. They figured she'd give voice to positions not shared by Gov. Peter Shumlin on wind power, the F-35 bed-down and Green Mountain Power's merger with CVPS. But at the first gubernatorial debate of the season Wednesday at 7 p.m. on Vermont Public Radio, Smith will be nowhere to be seen — or heard, more accurately. That's because a recount to determine whether Smith actually won the Progressive primary won't take place until Thursday. In the initial count, she was one vote shy of Progressive Party chairwoman Martha Abbott, who subsequently dropped out of the race. So VPR is moving forward with just Shumlin and Republican challenger Randy Brock. Patti Daniels, managing producer of VPR's Vermont Edition, says the station has been "planning a few contingencies" to deal with the lack of clarity in the Progressive primary. "But when we learned Friday that the recount will begin after the debate, that decided the situation for us." Daniels says that if Smith ends up prevailing over Abbott, "we will make every effort to get her on Vermont Edition soon after that decision." VPR's long-standing policy is to include only major party candidates in its debates, so neither independent gubernatorial candidate Emily Peyton nor United States Marijuana Party candidate Cris Ericson were invited to participate. 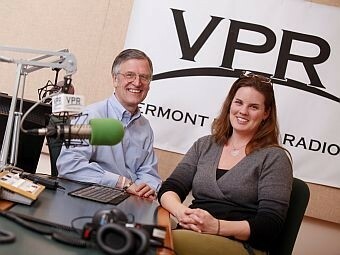 Photo of VPR debate moderators Bob Kinzel and Jane Lindholm from vpr.net.